I did say, a number of posts ago, that I’d share some more shots here from my summer gallivants, eventually. How ’bout now? The unchanging sunny heat in the tag-end doldrums of summer break in north Texas are almost inevitably a time when my heart turns toward the shoreline beauties of any coastal places I’ve lived or visited. It’s no different now, unless you count that I’ve been gradually going through and editing more of the vast collection of photos I took on our various trips, including many shots of said seaside spots. So, without further ado, some views of this summer’s watery shiny-object admiration. I’ve enjoyed these six years of living in north Texas, and I expect to enjoy the next whatever-number of years here, too. But after just returning from a roots tour of sorts in the Pacific Northwest, visiting family and familiar territory where I grew up, I am reminded that the riches of one’s birthplace can have no insuperable competition elsewhere in the universe if one has been as blessed with hometown wealth as I have been. I won’t say much more, because yes, I am happy wherever I find love and landscape enough to keep me contented, but I will leave you with a couple of photos as food for thought on the subject just the same. I suspect you know whereof I speak, no matter where your roots lie. Texas Hill Country has its magnificent bluebonnets in proliferation in a good spring season, to be sure, but are they any more exquisite than the carpeting of blue lupines on the flanks of Mt. Rainier in *her* glory? There aren’t *that* many cities where a mere parking strip is as likely as not to be a fully fledged Raingarden, loaded with a mass of flowers, vegetables and fruit, and xeric plants all exploding with texture and color. A soaring modern skyline, the deep, cold waters of the Sound, and the beach life of leisure scented with fresh-caught fish and chips. Don’t tell me that isn’t pretty fine stuff! The only time I’ve ever been on a sailboat was to sleep. There’s a great Tall Ship converted into a youth hostel in Stockholm where my sister and I bunked for a couple of nights on our college gallivant across western Europe. [Which hostel appears to have been recently renovated, and very nicely, if any of you should be interested.] While there may have been the faintest of motion rocking us to sleep in our on-board berths, I doubt it replicated very accurately the sensation of actual sailing. My next opportunity was during graduate school when I got a fan letter (one of the very few in my life, as you can imagine!) from a stranger who’d liked a gallery art installation I made so much that he offered to take me out sailing to the nearby islands. I don’t think there was anything predatory about him, but besides my still having a grandiose case of social anxiety in those days, there is the fact that the art show in question was entirely a walk-through, life-sized illustration of an espionage thriller; while I am doubtful that was his inspiration, I didn’t take him up on the offer. But whenever I see a sailboat, I do think it’s a beautiful representation of a genteel form of freedom that captivates my imagination all the same. Yes, I know plenty of tales of grueling trials on the high seas, no matter the size of the craft; even some of my close friends and relatives have such stories to tell, thankfully, having survived them. And I know, too, the old joke about testing one’s real interest in boat ownership by dressing up in a rain slicker and standing under an ice-cold shower for a couple of hours while flushing hundred-dollar bills down the toilet. But I also know that a vast number of people who could jolly well choose to spend their money and time on less demanding, safer, and far less expensive pastimes still choose boating. There’s clearly a strong pull to counterbalance any such negatives. I, too, have spent some happy times on boats, just not sailboats. As a coastal kid, after all, I grew up thinking time spent on the ferries was as much pleasure and sightseeing as it was commuting or transport. I have been fairly miserable on a North Sea ferry in stormy seas while I was recovering from the stomach flu, but it did not so permanently scar either my psyche or my stomach lining that I didn’t look forward to the next time I got to be on a slow boat cruising along the shore, or perhaps best of all, in a rowboat or canoe, dipping the oars or paddle in with the rhythmic soft splashing that accompanies my reveries. Living far from any natural body of water as I do these days, I am beached like an old craft whose hull is no longer seaworthy. But like those old boats I see, dry-docked on the beach or alongside the tumbledown barn or in a weedy field, I keep in my soul a firm and loving memory of every good time spent with the waves rocking me softly from below, telling me stories of their own and inviting me forward, ever forward, wherever that might take me. Hey, Lookit What I Found! Crows are a great source of pleasure to me. I admire their bold, graphic good looks: wiry legs and strong beak, shining eyes, and smooth feathers accented with iridescent shine. I enjoy listening to their noisy announcements and conversations, knowing that whether one is broadcasting his name in braggadocio or informing the rest of the neighborhood of what she’s discovered, there is often more brainy expression and interaction going than in many a text-messaging flurry from a pack of attention-deficient humans. Crows can be aggressive and mean-spirited like humans, too, as I well know from working many years on a heavily treed campus where nesting season was Open Season on certain passersby whom the crows chose to bully. But for the most part, when they’re not busy trying to defend their territory they devote a goodly amount of time and energy to exploring and problem-solving and even humorous play, that is also surprisingly easy to see through an anthropomorphic lens. If I see a crow taking a particular interest in anything, chances are pretty good that I’ll find it interesting myself, should I follow its lead. I am too smart for you by half; you think you’re bright? Don’t make me laugh! To caw this jeering little poem at you from this, my beachfront home. 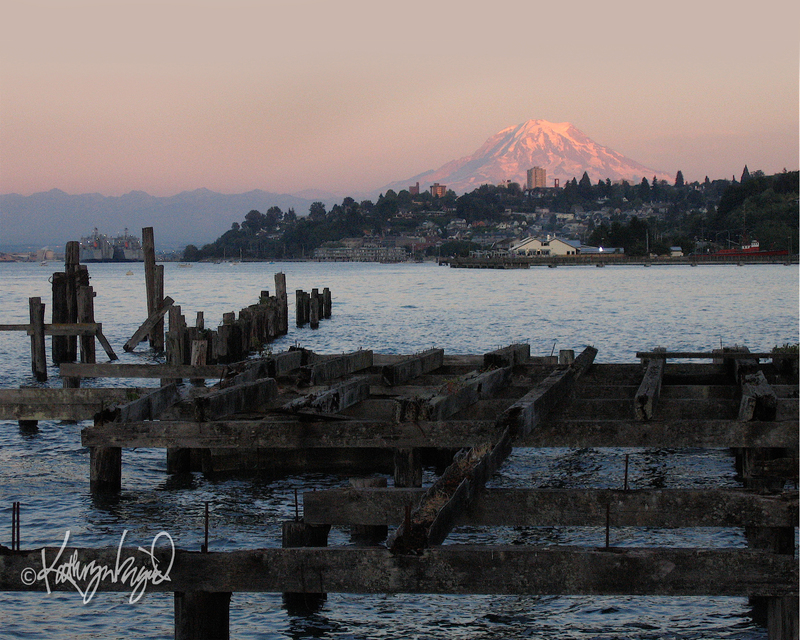 That magical time known as the Golden Hour seems to give everything, not just color, an extra fillip of beauty. Colors do, indeed, become warmer and more saturated when the sun is at such a low angle to the horizon as its place near dawn and dusk, but there is so much more to the mystical powers of those fleeting moments that it is a great treasure to be still in them and let the wonder fill me. At such times I feel more connected to nature and everything around me seems more in tune, better adjusted, and I feel that I am, too. How can the mere angle of the sun turn a scrubby lawn into finely cut velvet? The touch of gilt on the scene makes every ounce of it seem that much more precious and valuable. The bejeweled day, in turn, makes the simplest action in it take on significance it never had before: the chattering of birds in the trees becomes a miniature angelic choir; the dipping of oars in the water turns from a quiet splashing to the whispering of poetry; the evening breeze that gently stirs shore grass becomes a delicate communiqué from the harmonic internal logic of the universe, and I am at one with it all. As the golden hour ripples through my environs and begins to permeate me, I almost feel as if I am gliding along their silky way right in sync with the rowboats nearby, waving fluidly as the grasses on the verge, tipping my wings with the evening birds to slide onto the branches of the trees. I am at peace with the world, and the world, with me. That is golden indeed. 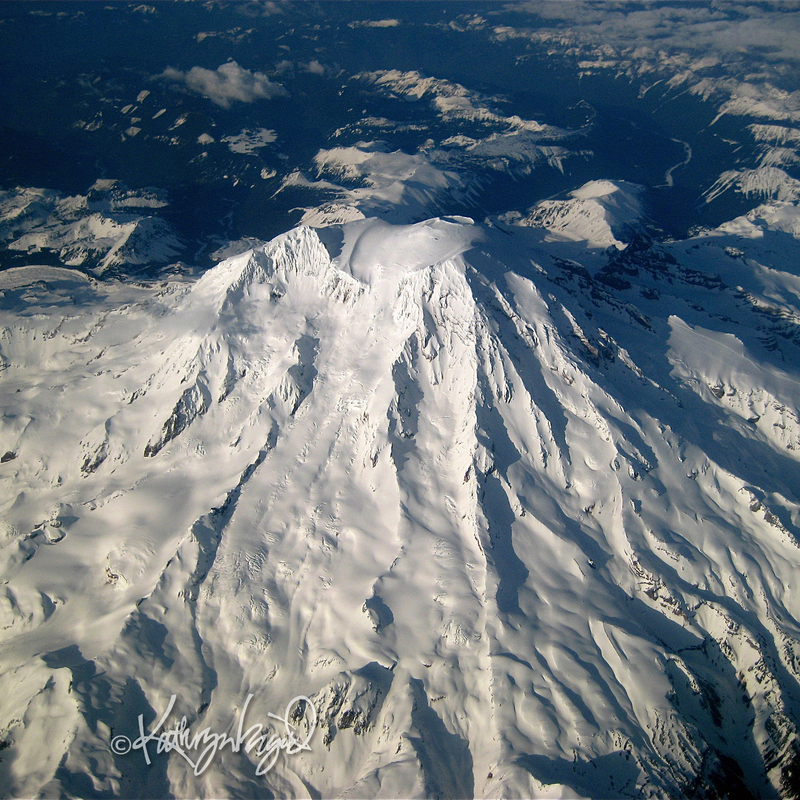 Perhaps this is true of other places, but I only know my hometown’s version of it: in Seattle, or pretty much anywhere in southwest Washington, Mount Rainier is frequently known simply as The Mountain. 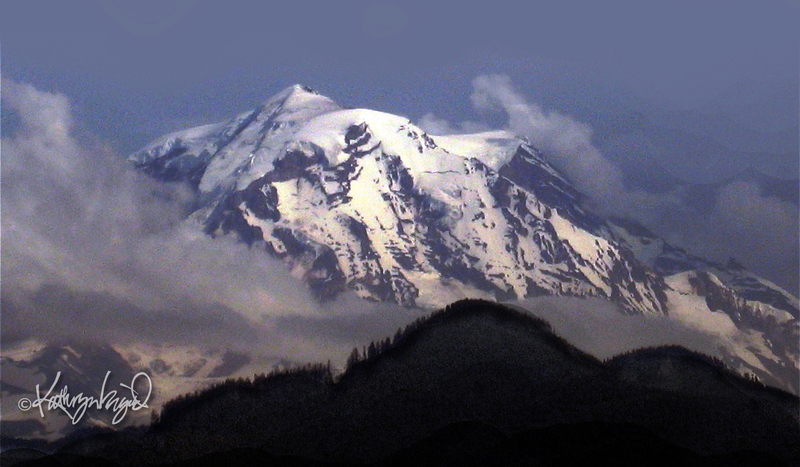 Yes, we call it by its full name, or by its ‘patrinomial’ ID of Rainier, and sometimes even by its graceful older name Tahoma. But its dominance of the skyline when visible, and of the ethos–the spirit–of western Washington thanks to its potent influences on geography and geological and meteorological character, not to mention the power it has to wipe out half the state should it decide to wake from its long dormancy, all mean that whether in plain view or not it has a hold on the hearts and minds of the locals like no other single force, natural or otherwise. 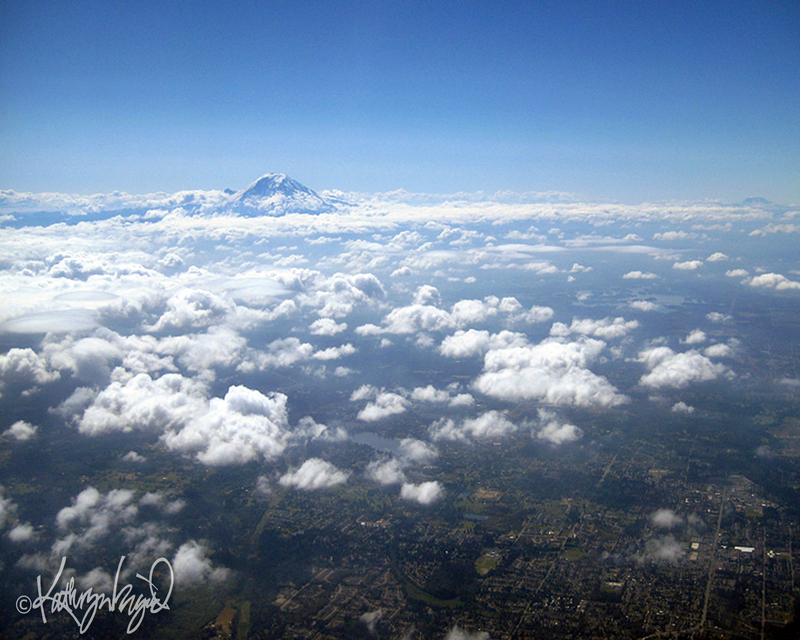 Sometimes when flying in to SeaTac airport the mountain is not only clearly visible but brilliantly etched and jutting boldly through the clouds, if any. SeaTac International Airport sits between Seattle and Tacoma, and the zone so called for its equidistance was finally officially given that insipid and cheap-sounding name some years ago–don’t get me started on it–but it’s well worth flying to a place with any ridiculous name you could conjure if and when you get the right weather, enough sunlight, and an accommodating pilot who appreciates Mt. 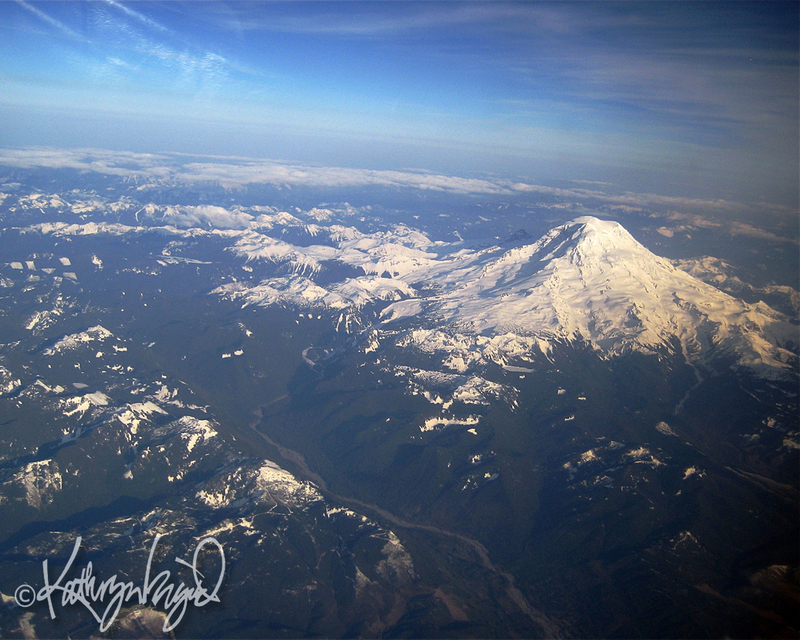 Rainier’s beauty enough to tip a wing to the mountain’s flank and give the passengers a clearer view. Truth be told, we’ve seen precious little of the mountain on our current visit. It’s been pretty overcast much of the time, including when we flew in, so yes, the photos here are from other times. I’ve known of visitors who left disbelieving we even have a Mount Rainier, never having glimpsed that big white heap of sugar in weeks and weeks of waiting. The fabled wet weather of the Northwest can indeed curtain off our magnificent totem from view for seemingly interminable times and make us long to be reminded ourselves that it wasn’t all an hallucination or a passion-fueled fantasy. Even when visible, Rainier very often sports a ‘hat’ or veil that keeps a little mystery close by; being large enough to create its own weather, this geological behemoth seems to be quite often crowned with a companion cloud that rarely moves very far off or disappears entirely. Despite all of this hide-and-seek, the imminent danger we all know quite well as natives makes us bolt, strap, glue and otherwise thoughtfully position many of our tall or breakable belongings as though to protect them from a petulant child, because we’ve been through enough minor earthquake shakers in our lives to know preparedness pays. Still, while rainy Washington makes floods a real and frequent possibility, if that dormant volcano in our midst gives the really big belch geologists tell us is historically overdue, whatever isn’t swept off in the violent and instantaneous post-blast lahars [pyroclastic mudflows] that will likely submerge the surrounding valleys (the primary lahar channel of which was home to my family for most of my youth) will be treated pretty much like a snow-globe being handled by a curious Godzilla. Game over. So we have a certain amount of respect for The Mountain, never mind it being such a fixture in our existence. No, I don’t know anyone who’s ever grown jaded about seeing it, no matter how long he or she has lived in its shade. This is not your typical mountain, looking pretty but losing its allure gradually as you realize you’re rather close and it’s stopped looming higher. It’s set in a fairly impressive range of mountains yet is so much bigger and more prominent than the rest that once the sky clears you just plain can’t miss it, and that sight quickly makes its mark on you. In snow-time, its blue-white flanks rise up to pierce the sky and look so sharply delineated you think you could stick your hand out and grab a fistful of super-vanilla ice cream from just behind that house over there across the street. As the snow melts, streaks made of billions of evergreens and a few exposed rocky prominences reflect sun and sky and passing clouds’ shadows in a changing array of colors that tease you with seeming first as near as your own breath and then suddenly as far distant as a too-sweet dream. Driving there can nearly drive you mad: you look to your left and it’s sitting right across the closest pasture; round the curve and it has shot away as far as the moon; over the next hill, in an instant it almost seems you’ll crash into the bank of snow just ahead of your front bumper. Eventually you get onto the foot of Mount Rainier, yes you do, and you realize it’s so huge that you can still have a view of the peak that seems remarkably like the distant view of the whole that you had from an hour and a half’s drive away. The flora and fauna of this glorious bump on the earth have changed relatively little in millennia, and just being in their midst for an afternoon’s traipse along the trails makes you think both that your own sort might go on forever and that if the mountain is really going to blow, perhaps its taking you along for the ride in instant smithereens might not be altogether the worst thing. That’s how magical The Mountain is, even after all of these years of living at its foot. It might kill me, but if it does it will have fed my spirits incredibly well for a very long time indeed. That mountain there, she may keep her chapeau of a cloud-let coquettishly low on her brow for long periods of time, but when she finally does doff it, Holy Mother of Gleaming Glaciers, she’s a beauty.